Published: Sept. 16, 2018 at 03:37 p.m. 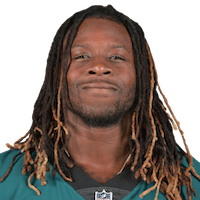 Published: Sept. 7, 2018 at 12:19 a.m.
Philadelphia Eagles running backl Jay Ajayi scores second touchdown of game on 11-yard run. Published: Sept. 6, 2018 at 11:21 p.m.
Philadelphia Eagles running back Jay Ajayi scores first touchdown of 2018 with powerful run up the middle.